My mum use to make huge quantities of lemon pickle and store it in those old fashioned ceramic brown and cream jars. The pickle would be served every Sunday along with khichdi and kadhi. She would make the pickle by leaving the lemon pieces in a container, covered with muslin cloth for days till the lemon peel would become soft. I never learnt how to make the pickle from her. A few years back Vibha bhabhi made the pickle and shared the recipe with me. Tips like leaving the lemon pieces to marinate in the fridge was my kaki’s valuable tip. I have tasted lemon pickle that is left in the sun and don’t really like it as it tastes like as though the lemon is about to rot. Perhaps they had left it for too long in the sun. I don’t remember my mum’s lemon pickle ever tasting like that. Two pickles that are always found in my fridge are chundo and lemon pickle. I love both with parathas, rotis, masala puris. I usually like to have lemon pickle with khichdi, stuffed parathas, theplas and chilas or pudlas. Make this pickle when you get nice, juicy and thin skinned lemons. When in season, I usually marinate them in salt, turmeric powder and lemon juice and store it in an airtight container in the fridge. After a month, the lemon peel becomes soft and that’s when I make the pickle. Wash the lemon and dry it with a cloth. Mix lemon pieces, salt, turmeric powder and lemon juice in a bowl. Store the lemon mixture in an airtight container and put it away in the fridge. After a month the lemon peel will become soft. Remember to mix the marinate occasionally. When the lemon peel is soft, prepare the masala for the pickle. Put the sugar or gur in a bowl. Add dhana jiru, pickle masala and red chilli powder. Add the marinated lemon and mix well. Cover and leave the mixture till the gur or sugar melts. Heat oil in a pan over low heat and add the lemon mixture. Stir the mixture constantly till it begins to bubble. Cover the pan with a cloth and let it cool down completely. Store in a jar and keep in the fridge to maintain the freshness or leave it out but in a cool place. Remove the seeds and whit part of the lemon otherwise the pickle will taste bitter. For a more sweeter pickle, add 1 cup of sugar or gur instead of ¾. If the ready pickle masala is not chilli enough, add red chilli powder according to your taste. Over cooking the pickle will caramelize it. Remove the pan off the heat once the mixture begins to bubble. When half the pickle is used up, I usually marinate another lot so that it is ready to be made into a pickle when I need it. 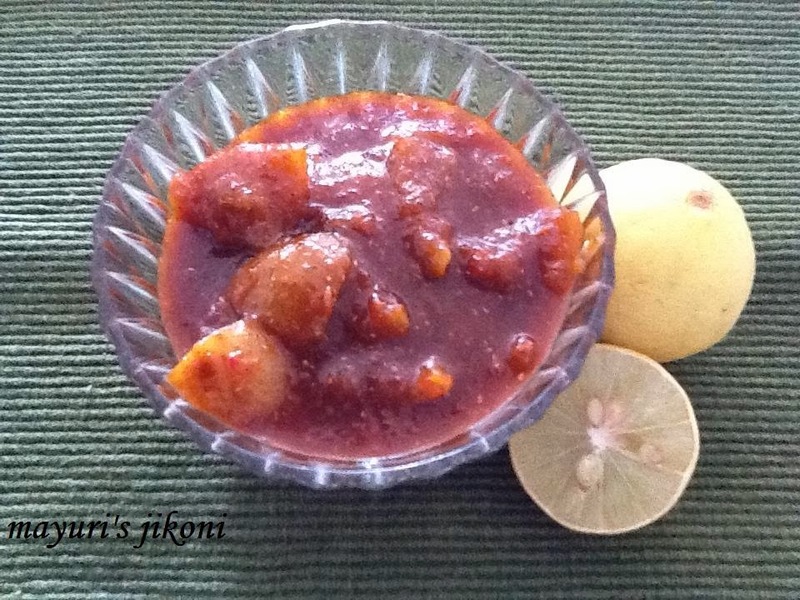 lovely lemon pickle perfect with parathas and rotis. Thanks for sending it to Lets cook preserves, jams and pickles.